Captive Fasteners® provide permanent attachment points in a wide variety of applications. Captive Fasteners® are available in three basic groups: Self-Clinching Fasteners, used with ductile materials; Broaching Fasteners, used with non-ductile materials; and Weld Nuts for sheet metal. Self-clinching and broaching captive fasteners install into a round hole punched or drilled into the seating material while weld nuts are attached to the surface of steel or stainless steel sheet metal. In all cases, the attachment is permanent eliminating the possibility of loose hardware. 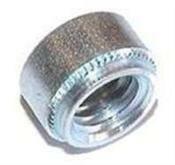 Captive Fasteners® are available in a variety of fastener forms from nuts to studs to pins and standoffs. They are normally formed from steel, stainless steel and aluminum. Provides strong internal threads in material too thin to tap. Special versions include blind end, flush, locking and miniature types. Inch and metric sizes in steel, stainless and aluminum. CFS2 flush mounted screws can be assembled with CFR2 & CFN2 components to create a panel fastener assembly. Broaching-type fasteners are designed for use on printed circuit boards and on most brittle or hard materials: glass laminates, epoxy or resin with paper, nylon, or canvas bases. They are also used on materials too thin or unsuitable for threading, such as acrylic and polycarbonate panels. Self-clinching standoffs are designed for quick, easy installation with any standard pneumatic, hydraulic or mechanical press. Through-threaded or blind standoffs are used in metal panels with thickness of .040 in. (1.0 mm) and up. No secondary operation, such as reaming or deburring, is necessary prior to installation. Studs provide a strong flush-head assembly in material as thin as .040 in. (1.0 mm) with high torque-out and pushout performance. Pins provide a strong flush-head assembly in material as thin as .040 inches (1 mm) with high torque-out and pushout performance.